A life of contentment in the rainforest. The Korowai People of West Papua in Melanesia. 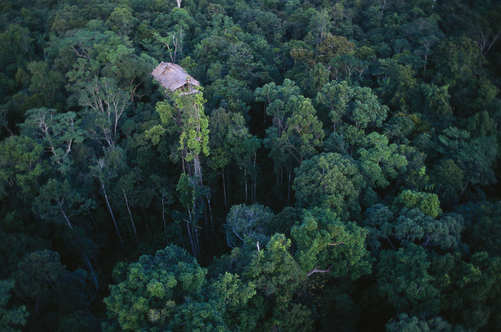 Irian Jaya’s Kombai and Korowai people live in houses built in the treetops. 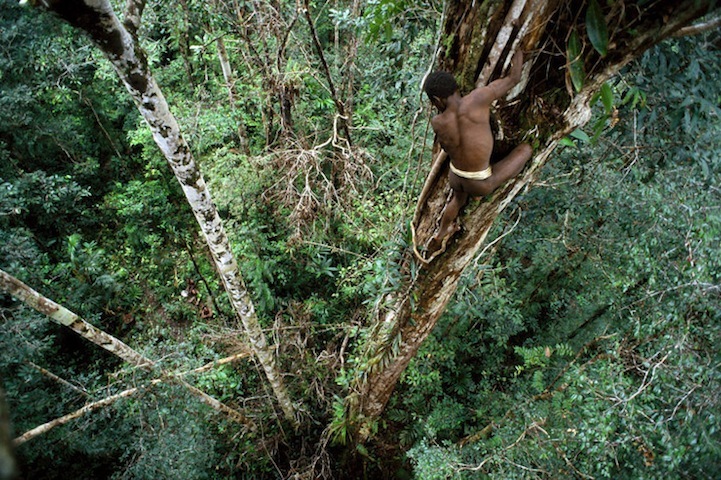 Living in the trees is natural for the Korowai and Kombai people in the southern eastern Papua. These tribal Melanesians are one of the last people on the planet who survive purely on their natural environment. 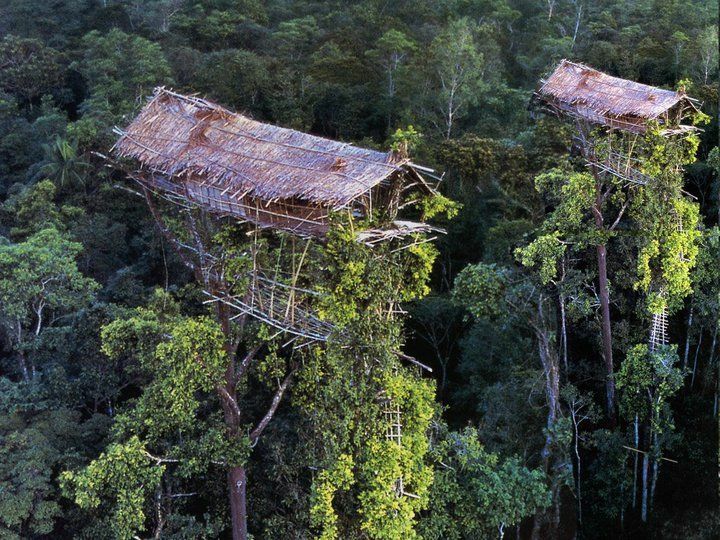 The Korowai’s are also referred to as the Kolufo and have become known to the world through pictures and documentaries as one of the most amazing architects of tree houses. The tree house builders survive in the basin of the Brazzan River in large areas of deep rainforest and swampy lowland. They are hunter-gatherers and horticulturists who practice shift-cultivation and have a very rich and an extraordinary oral tradition. They live together in small communities. The higher they built a house, the more prestigious it is. The reason behind this amazing architecture which often reaches up to 100 feet or more off the ground is to avoid floods, insects and diseases. It was also a way to spot tribal enemies as the Korowai themselves had practiced cannibalism in the past. Sowayen climbing down a “yambim” or ironwood tree after knocking loose a nest of black ants that he uses for fish bait. The Korowai are superb climbers, and get up thick trees like this by gripping vines with their hands and splayed toes. This picture was taken as part of an expedition for GEO Magazine and National Geographic Magazine to document the way of life of the Korowai tribe. The Korowai people build their houses high above the forest floor, and deep in the swampy lowland jungles of Papua. In the BBC documentary below, you can watch from start to finish, how a Korowai tree house is built. Hi – whoever you are, maybe you are right… maybe three different sources meant 35 metres, but said “up to 100 metres instead of feet” as I’ve quoted – but next time, find a better way of communicating with a fellow blogger rather than sounding like a know-it-all jerk, just because you swing around like a monkey in the trees all day. Hey there. I didnt mean to come across as either, my apologies. I agree, materialistically we might be well off, but emotionally we hardly find contentment and if we do then it doesn’t last long. Love your creative treasure trove Joycelin. 🙂 I’m glad you enjoyed yourself. Thank you for visiting. I’ll be over soon. Thank you very much sis. Laikim. Thank you very much for reading Teagan. Good to see you. Personally, I am very scared of that height – even though I am not afraid of flying. This is so interesting! I have pressed it to reblog later if that is OK? Excellent post! Thanks! Yes you can re-blog Patrick – any time! Thank you very much! It looks like a hard life but probably one much less stressful than life in cities with its rat-race attitude. And all the physical work keeps them all so fit. I imagine there will be some kind of pulley system to ge old and invalided people up to the tree houses. I guess they would have something like that – who knows. I have only seen these houses from a helicopter Millie. They are like a very large bird’s nest. Love them! From a city/urban and modern environment….amazing daily life style.